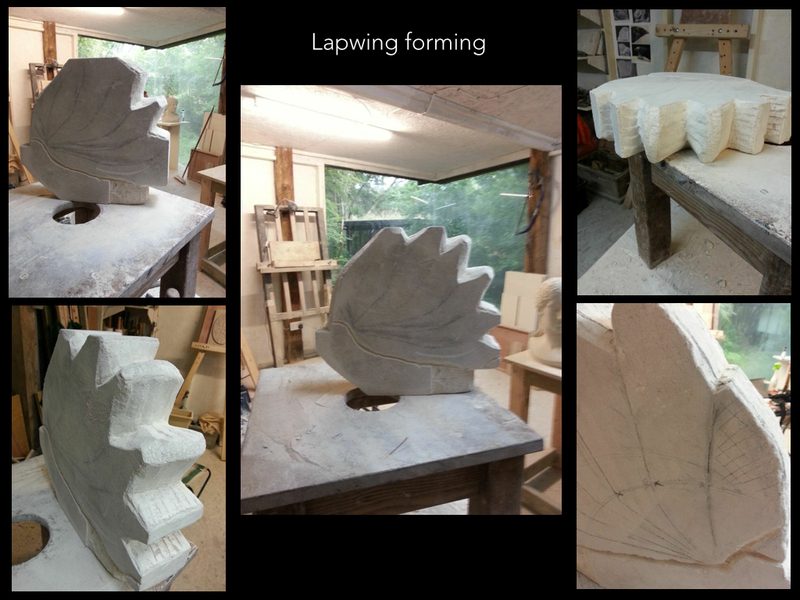 The even, squarish slab of Portland limestone stood on the work table. Smooth, whitish, cold, dense. A mere chip of the Earth, secretly encasing millennia of crushed sea creatures and shells. Its silence was no indication of the language it would express as the novice stone carver began her apprenticeship. The teacher, artfully skilled, quietly exuded a passion contagious to the small group. 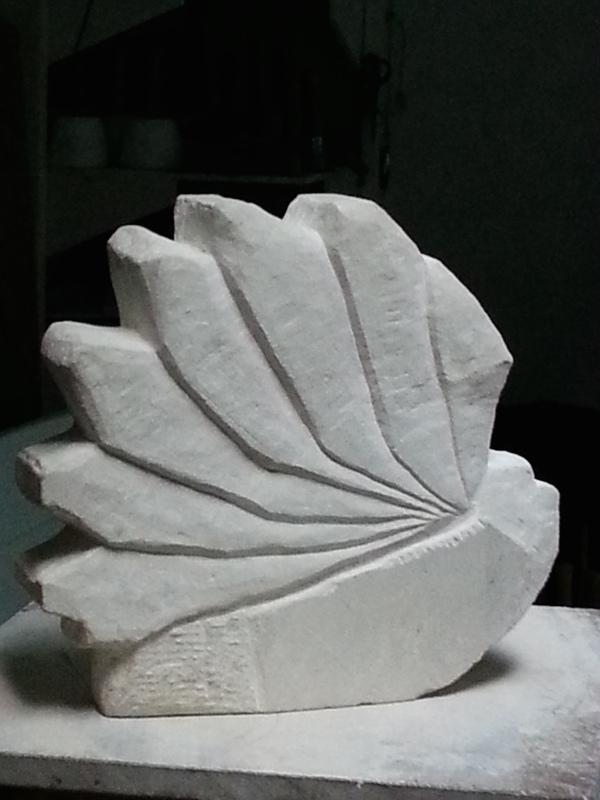 The student felt humbled by the enormity of the task to render her design – so far sketched in 2D and roughly shaped in a tiny plasticine model – out of this taciturn lump of stone. Paper, pencil, plasticine, suddenly seemed like child’s play in the face of the stone’s looming ambition. Necessary steps nonetheless as part of the learning process… to start with the ideas, the vision, the easy sketches, the laughably oversimplified plasticine form. Otherwise where would we begin? Stone is too enigmatic, too daunting to tackle without preparation and appropriate thinking ahead. Deep breath. Onto the stone we went. First step. Draw (with a pencil!) 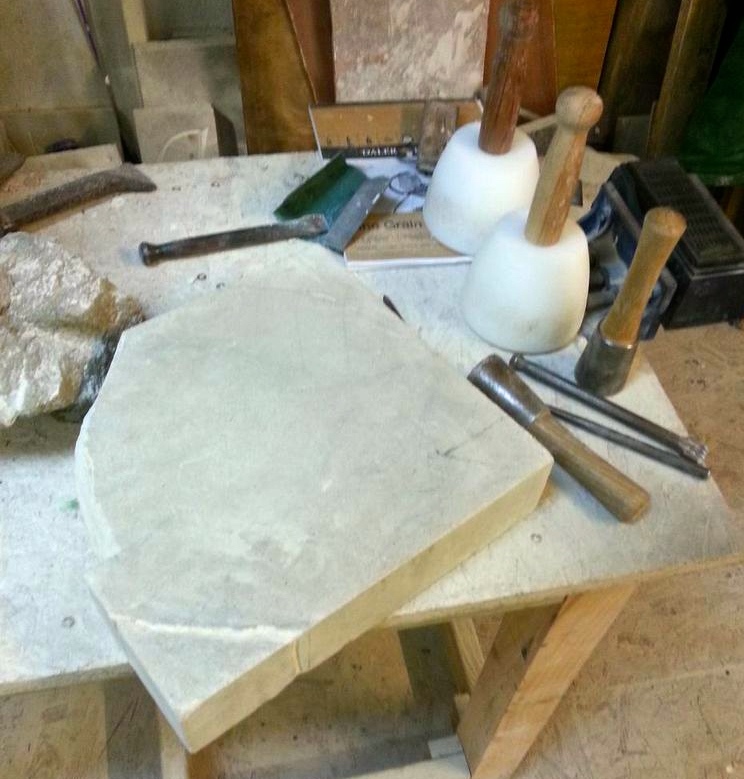 a geometrical outline of the basic shape of the piece onto the stone itself. Of course, we need basic lines to follow at this stage. Then, tools up. Chisel in the left hand, mallet in the right. First obstacle. The student’s left hand was not her dominant, yet its job here was to guide the chisel along the line to make a groove, as the mallet hit it with her right dominant hand. As the brain’s reasoning attempted to control the motor skills required for this introductory feat, the hands, arms, body lost all sense of direction. She could not master how to hold the chisel so the groove was made along the line. Nor could she position her body in relation to the stone to feel at ease. As for the mallet action, at least it made contact with the chisel’s top end, though her forearms and biceps quickly felt the force. Was it supposed to be such an intense work out? No. The teacher calmly explained how to apply the mallet, using motion from the shoulder. As for the chisel which was the main culprit… hold it at 45 degrees from the stone, most of the time, which suddenly made sense. Hours later, by the end of Day One, she could use the chisel to make grooves along the lines. Such a small achievement, in relative terms, yet what a feeling of mastery. To battle with the unknown, the discomfort, the inability to do something well at first. To then understand the mechanics, apply the discipline until it worked repeatedly – almost instinctively – and to feel the confidence rising. In addition, there were masonry style accomplishments too – making a shelf, to then chip off unwanted lumps, using a claw and nylon mallet – so the basic shape started to emerge. The even, squarish slab of Portland limestone was changing into something different, something more vital. The student too. The project was substantial. 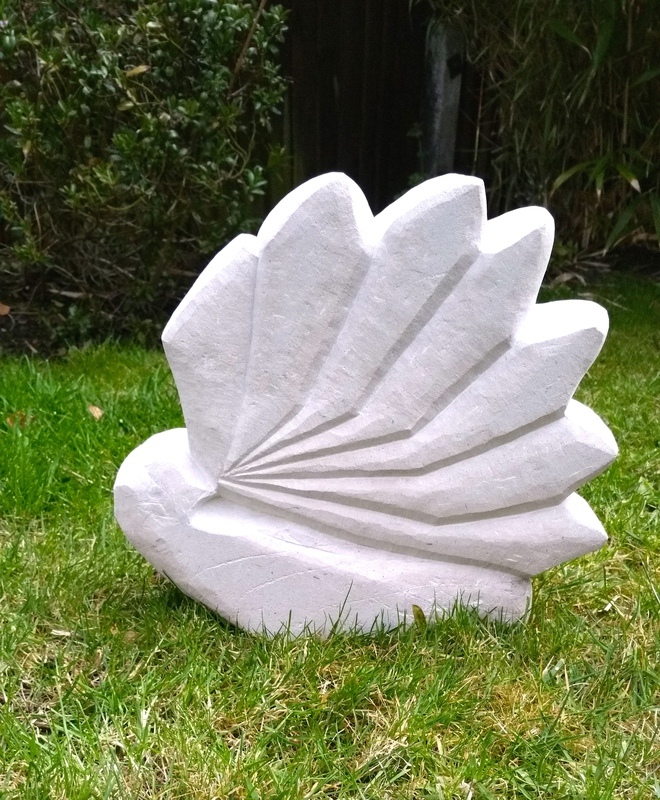 With an interest in wildlife and subsequently birds of the region (Cornwall), the student had chosen to sculpt an abstract form of a Lapwing. A beautiful creature in sound, flight and colour. 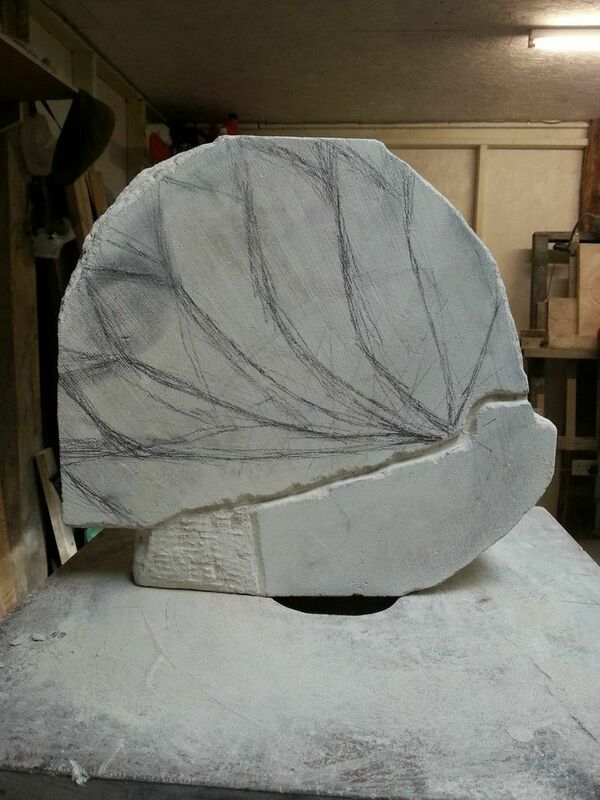 From the inspiration of a photo, followed by a couple of lavish realistic sketches, transformed into an abstract shape, then further versions of abstraction, it was only on Day Two that the stone rendition of the vision began to materialise. The shape was still rugged and approximate. The claw had left its chunky marks where lumps had been hammered off. It was not yet pretty, yet to the student, it was fast becoming magnificent. 3D stone sculpture – explained the teacher – is about where the planes meet, how the light reflects off them, and how it looks from every angle possible. Separating the wing section (more geometrical) and body form (more rounded) was next. Dig deep, make a clear demarcation between wings and body. Following a relatively simple, curvaceous line, the student dug in, deeper and deeper. One side then the other. The anguish of chipping off bits by mistake, or slipping with the chisel – making unwanted cuts – still bubbled underneath the student’s newly acquired confidence from Day One. However with practice, focus, discipline the anguish melted into a peaceful, methodical rhythm – tap tap tap, tap tap tap, tap tap tap. It was mid way through Day Two the student realised the Lapwing would take longer to finish than the four days allocated on the course. She was enjoying the stealthy, methodical, slow pace of understanding what the stone was about, how the tools related to it, and what influence (if any) she had on making the shape come into its own. A flood of relief that this was not about taking a trophy home – like some holiday souvenir – coursed through her veins. The realisation this piece would take the time it wanted. That the student had no power to rush the stone to a finished product, to display proudly for others to admire, removed all the pressure she had been feeling latently to speed things up. This shift in consciousness changed everything. The stone relaxed – happy that the student had grasped the significance of the spell binding process she had undertaken. The process was the art. The art was the process. The end result promises to be a much better witness to the art of the process, since every part of the stone removed, every shape carved has a purpose. With purpose comes clarity. With clarity, better decisions. With better decisions, a life with more meaning. The rugged, clawed, changing slab of Portland limestone was sharing its wisdom. The student was listening. Fatigue set in. 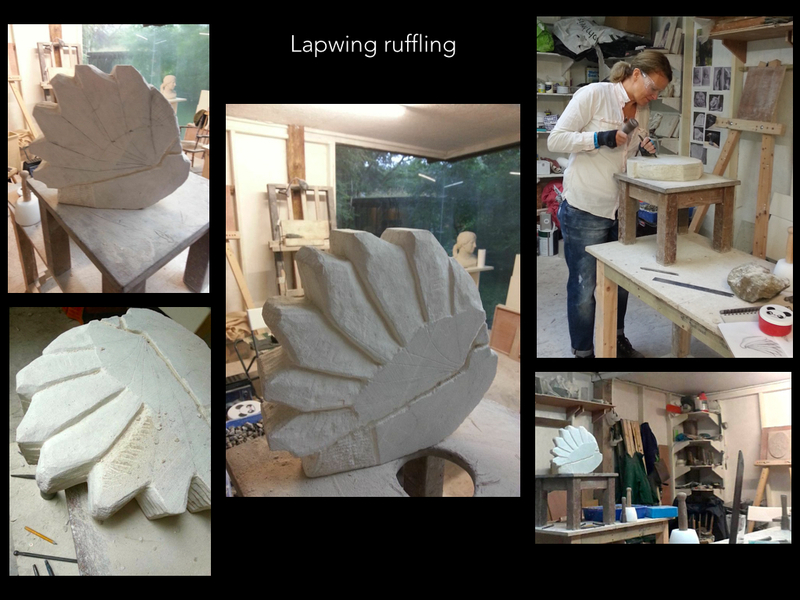 The student felt the weight of the work creep through her limbs and bones stunting her stamina as she moved her body slowly towards the next stage of carving the Lapwing. Today the feather tips of the wing. Angular, triangular-almost lumps to remove – tricky manoeuvres. Make the groove, one side, then flip the stone over and make the same groove on the other side. Flipping the stone was an effort – it was heavy, ungainly, but this was the way so the student leaned into it. Make grooves, then shelves, then in with the point chisel to make incisions, to weaken the compacted angles. 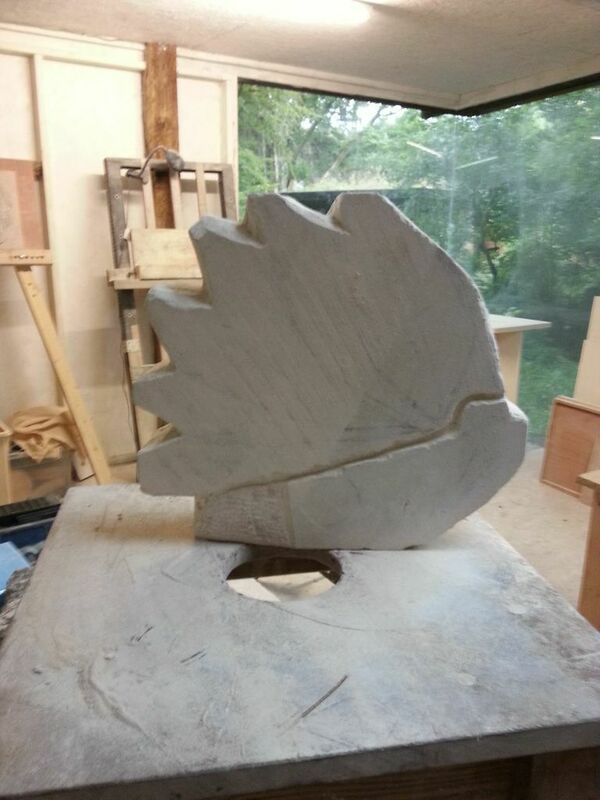 Claw action next, then the point, then the claw so the tips of feathers began to look like tips, as a V shape was made going into the stone. The way to remove such lumps is to create vulnerable overhangs or bumps that can then be hammered off effortlessly. Creating vulnerability started to become a problem to the student. The stone appeared stubborn, and would not give her access to its vulnerable sides. Overwhelmed by the inability to make the stone weaker, the student felt a welling of tears, a sudden unstoppable rush of emotion that revealed her own vulnerabilities. She felt disarmed and weak. Must be the fatigue she thought. Or maybe it was the stone taking a stance. I’ll show you my vulnerabilities if you show me yours. Though the student felt awkward, she was secretly in awe of the learning experience the stone silently offered. She took a step back, a big deep breath, and stopped trying so hard to force the vulnerabilities to open up in the stone – rather she eased her way in, respectfully, gently, hopeful the stone would cut her some slack, if she cut it some. Something did change. The force previously administered to overcome the stone’s stubborn-ness gave way to a more fluid approach, which split the stone’s vulnerabilities wide open. The remaining feather tips were carved with ease and inside laughter. The diminishing slab of Portland limestone was revealing its force of character and its vulnerabilities. The student felt exposed and more complete for it. Having made the decision to stay an extra (fifth) day to get as far as she could with the teacher’s expert guidance, day four was like a holiday. The main, rough form of the Lapwing now stood proud, wing tips pointing outwards, upwards. There was a dynamic, energetic feel to the sculpture now. The limestone was fully awake, and ready for its close up. Laying the stone flat, the teacher demonstrated how to use the scriber. It was like a steel version of a pencil. Though, later research revealed this tool was ‘carbide tipped’. Taking a ruler, and running the scriber along the pencil lines of the feathers, a precise, shallow groove was made. Pencil rubs off, the scribed line wouldn’t. Trickier, more precise work was now to commence. Carving the form of the feathers, one by one, so their geometrical fan like appearance would catch the light, the breeze, and almost ruffle at first sight. Well, that was the idea… proof was in the work, the detail, the methodical approach, one feather at a time, though only three quarters of the way down. Suddenly the student felt a different, stronger connection to the stone as if at last the latter were yielding willingly to her artistic touch. This silent dialogue produced a surge of energy and focus in the student. She worked faster, more confidently, appreciating each movement made with the mallet and various chisels. The teacher demonstrated how the planes between each feather needed to meet seamlessly, and evenly. So when examined at eye-level they exposed a straight v-shaped gully effect. No bumps, no curves, no crumbs. This was far from an easy task. The student was adamant she apply absolute care in getting as close as possible to the desired effect. She worked into early evening, well after teacher and other students had left for the day. She enjoyed the alone time with the diminishing Portland limestone whose density was softening under the meditative tap, tap, tap of the tools. The student too softened, and expanded…her feathers stirring for flight. Last day under expert supervision, the atmosphere was calm and casual. The student had the studio to herself and the teacher ducked in and out, giving guidance, working on his own piece – a stunning form of a thrush, sensual to the eye and to touch that was in its final stages. The student observed with quiet admiration and was moved by the gentle magnificence of the teacher’s sculpture. Lead by example, break it down into manageable tasks, be clear, articulate with instruction, demonstrate. Brains are putty. They can be moulded, shaped, pulled and pushed into different shapes if allowed, encouraged. The student’s brain had yielded to the putty test and had acquired a whole new set of motor skills, and artistic intuition, unlike any she had ever experienced. The lower part of each feather awaited her chiseled touch to bring the wing concept to a visual conclusion. A much finer, more delicate application of the tools was called for. The student changed stance to give the precious nature of this stage the lightness of handling required. It was a far cry from the first day of masonry and beating lumps off crudely. Each stage had demanded a different approach and mindset… let alone manual ability. It was exhilarating to have learned such an amount in five days. After a conference on the body shape, and head (as yet an undefined form which the student and teacher disagreed over quite passionately), some additional lump removing went on. The bird was turned upside down, held in a vice on a workbench. Moving around the stone became more efficient and methodical. 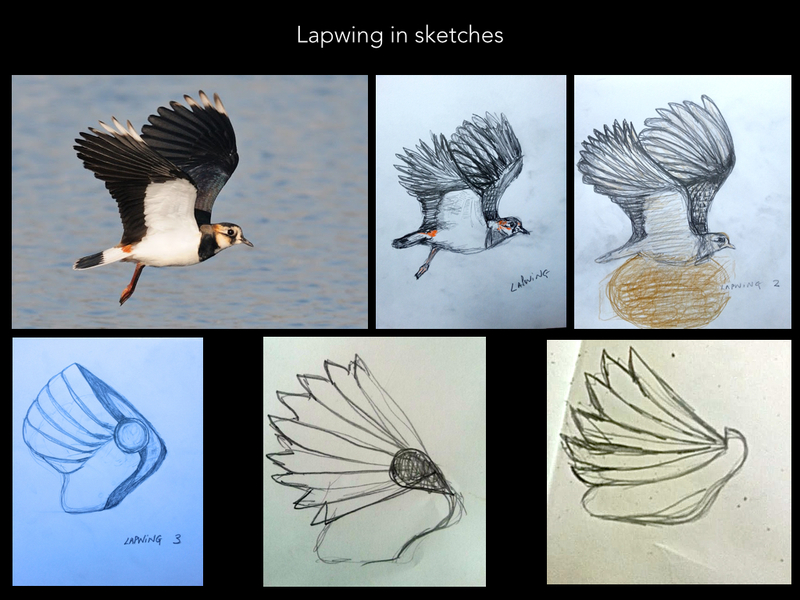 The day concluded with final touches on feathers – one side of the Lapwing was 70% of the way there. So much more to do…the body, the head, the entire other side of the wing, with its seven feathers that had to mirror the first side. The student felt complete though. To have got this far and still be fired up to finish, even if it took till Christmas. The plan was to take the Lapwing back to London, work on the other side, and where possible on the body, then return to Cornwall for a final conference and day’s work on the controversial head. The teacher lent the student three chisels, a Clipper shopper bag and bubble wrap for transportation. One last conference for ideas ‘sans’ teacher. 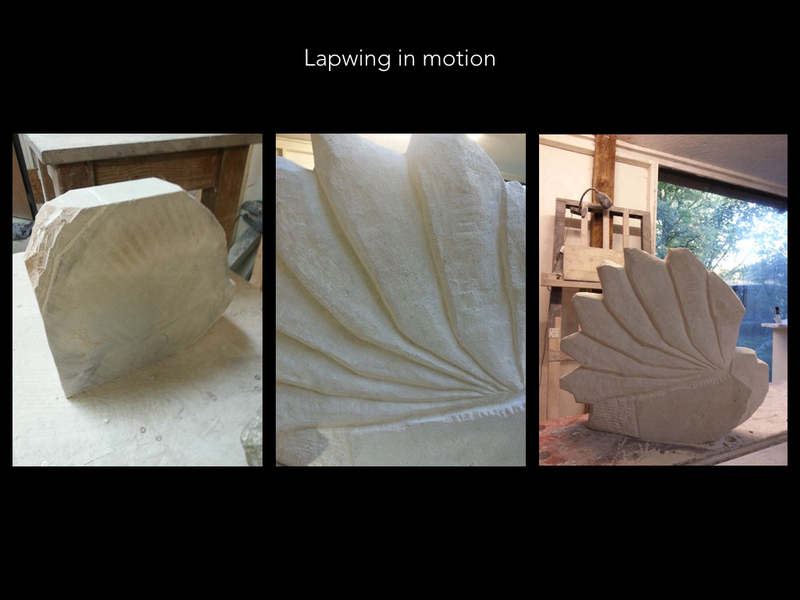 The slab of Portland limestone was in motion, the student could but follow.